This bike tour in Austria and Switzerland takes you through the lush Engadin region. In Romansch, which is the indigenous language of the area, "Engadin" literally translates as "the garden of the Inn River". 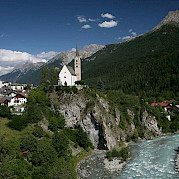 The Engadin valley includes the entire area of the Inn River valley, its tributaries and the surrounding mountains. This region is stunningly beautiful. Its quaint villages, meadows full of wildflowers, valleys with gurgling brooks, and high rugged mountains take your breath away. An artist equipped with brush and colors would need weeks to capture the essence of this tour. The Inn cycle path leads through this outstanding landscape as the Engadin merges into the big forests of the Swiss National Park. Suddenly the scenery changes and the Austrian Bundesland Tyrol welcomes you with warm hospitality. 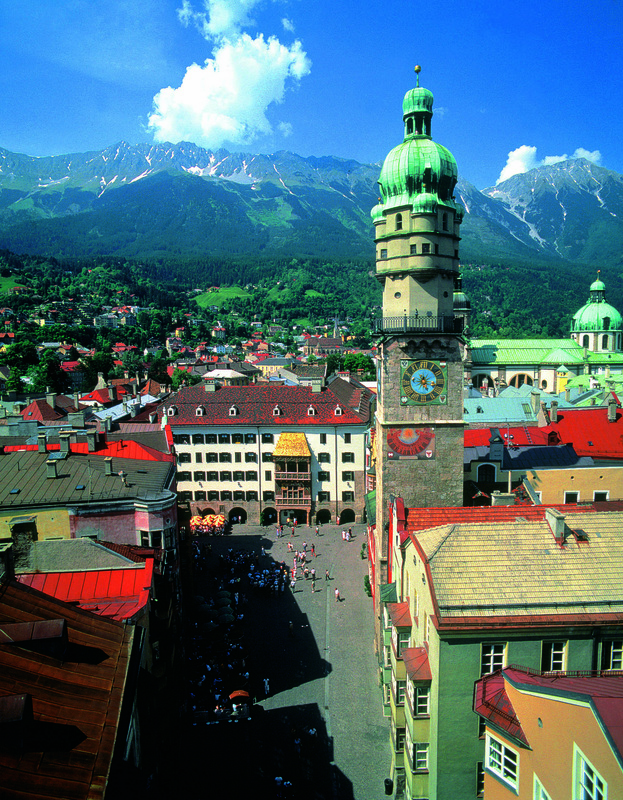 The tour ends in Innsbruck where your stay in the Olympic city is one of the highlights of the Inn cycle path. 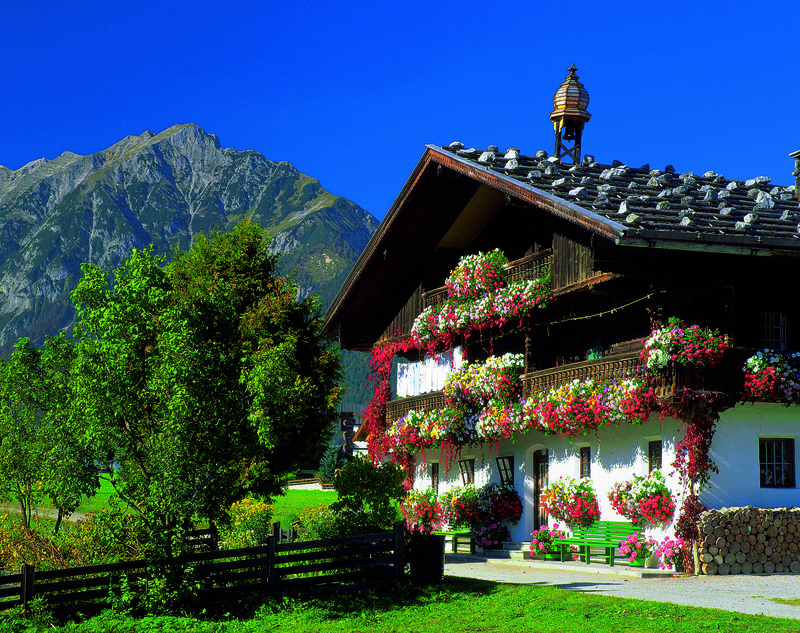 Be sure to check out all our bicycle tours in Austria and Switzerland, too! There are couple of options for arrival airport depending on your specific travel plans. 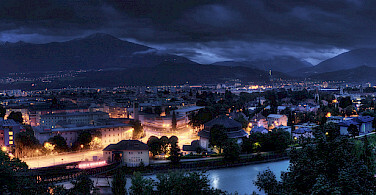 You can fly to Zurich International Airport, Bolzano, or Innsbruck. Train (Zug) from airport (located beneath the terminal building) to main railroad station downtown (Zurich HB), runs every 20 minutes in both directions with a travel time of 10 minutes. From Zurich HB, trains depart for all points in Switzerland. 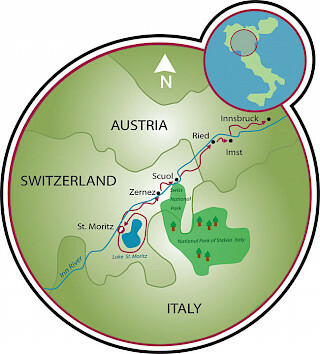 Trip to St. Moritz usually takes about 3 – 4 hours. 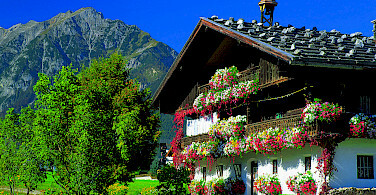 Extra nights available in both St. Moritz and Innsbruck. *All distances are approximate. The 7 day tour does not include a loop around St. Mortiz. Day 2 is your arrival day. A transfer back to Moritz cannot be booked on Saturdays. 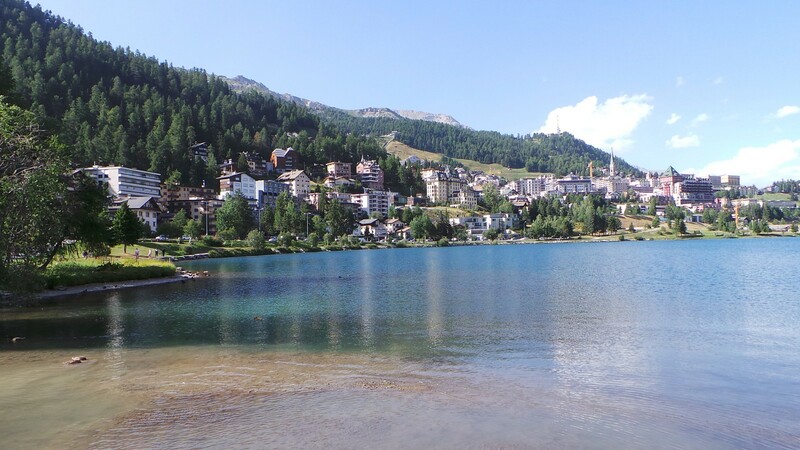 Chic, elegant and exclusive, with an extremely cosmopolitan air, the resort of St. Moritz is located at an altitude of 1856 meters above sea level and surrounded by the beautiful lake landscape of the Upper Engadine. The local tourist office claims the sun shines 322 days a year. 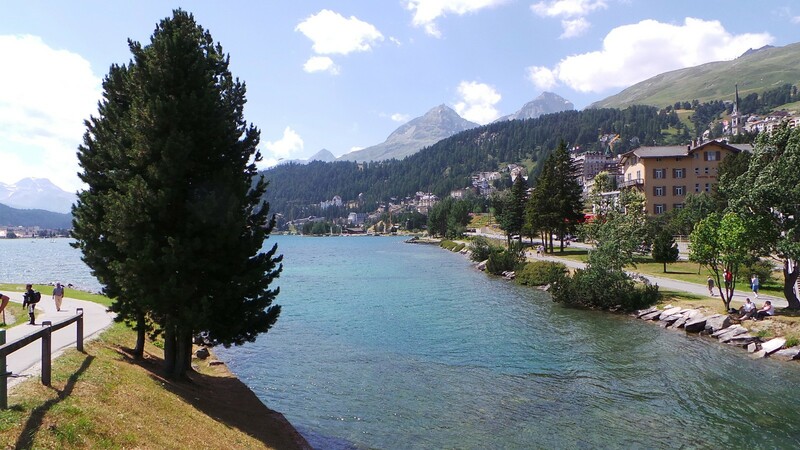 Explore the fascinating surroundings of St. Moritz and perhaps undertake a tour by bike of Lake St. Moritz, one of the several lakes in the region. 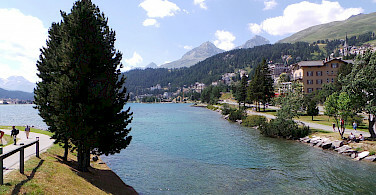 The Upper Engadin lake landscape is a unique phenomenon. The wide valley basin actually has a string of wonderful lakes, each with its own individual character. 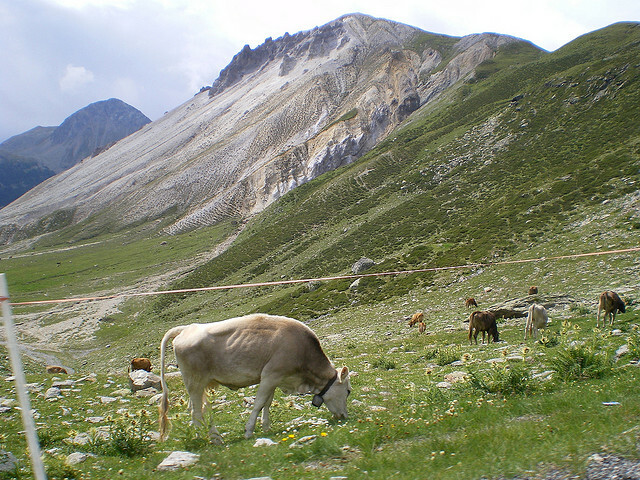 You will be traversing the valley of the Upper Engadine region, the door to the Swiss National Park. 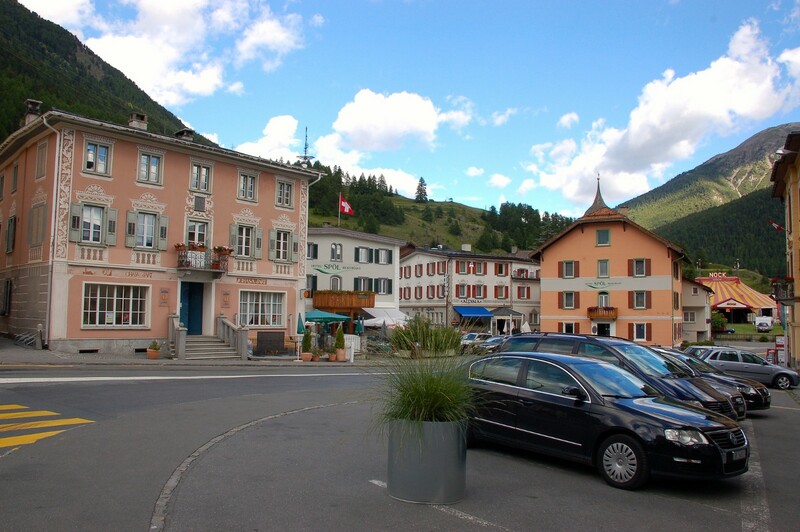 Samedan is the first village today that you will cycle through. Worth seeing is the old St. Peter Parish Church with its Romanesque tower, built around 1200. Next is La Punt , a picturesque village strategically located at the sun kissed foot of the Albula Pass, directly next to the River Inn. Beautifully adorned farmhouses and stately patrician houses from the 16th and 17th centuries stand majestically in the village. 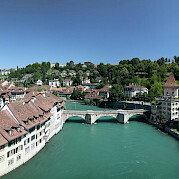 A bridge over the River Inn leads from the La Punt part of the village, to Chamues-ch. Worth visiting is the early Gothic church of San Andrea in Chamues-ch, a classic example of a Gothic mountain pilgrimage church with a slim, white tower, Romanesque door and Gothic vaulted ceiling. The nave and chancel are adorned with frescoes from 1505. Also worth seeing is the La Punt baroque church built in 1680. 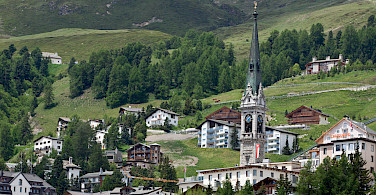 Another village that you will cycle through is Zuoz , an example of a traditional Engadin village. 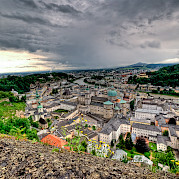 It has many cobble stoned streets, an elegant town center and numerous beautiful old buildings. There is also the church of San Luzi with its beautiful window paintings that you will not want to miss. 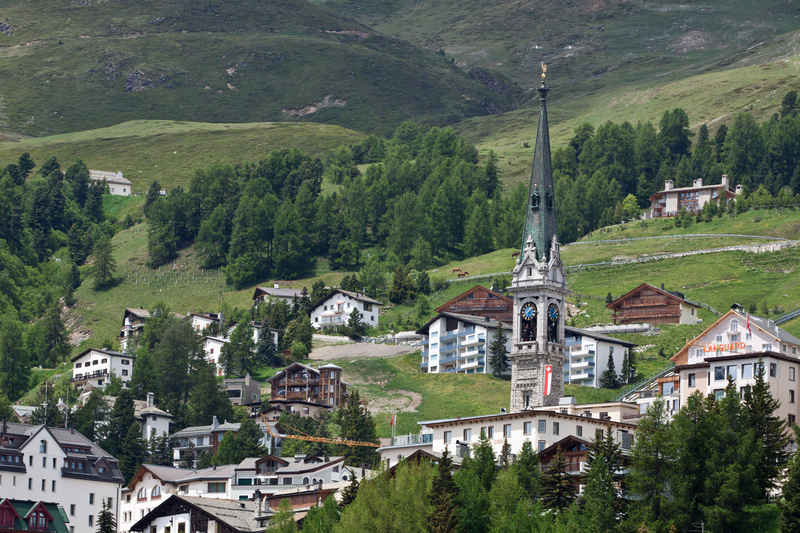 Continuing on through the Engadine high valley, your final destination today is Zernez, gateway to the Swiss National Park, Switzerland’s biggest nature preserve, featuring a fascinating wilderness which provides a habitat for a great many Alpine animals and plants. After breakfast, your first stop will be the old mountain village of Lavin. The village, on a long terrace on a south-facing slope, was rebuilt in Italian style after being destroyed by fire in 1869. The late-Gothic village church escaped the flames and has valuable frescoes dating from the late-Gothic and early-Renaissance periods – one of the best-known and worth seeing art monuments in this federal state of Graubunden. Next on the agenda is the village of Guarda. 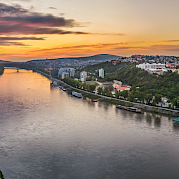 Once an almost deserted place due to its remote location, it has been revived after most houses have been renovated and sold at attractive prices. Guarda is a quaint village of narrow roads with those beautifully renovated houses that preserve the traditional paintings and lovingly decorated doors and windows. Your final destination today is Scuol, an innovative holiday and spa resort– where mineral water bubbles from the village fountain and a park like environment surrounds. Dominating the village is its majestic landmark, the Tarasp Castle. Soothe your weary muscles in the thermal spa of Bogin Engiadina. Today you will cross the border into Austria, passing through the village of Martina. 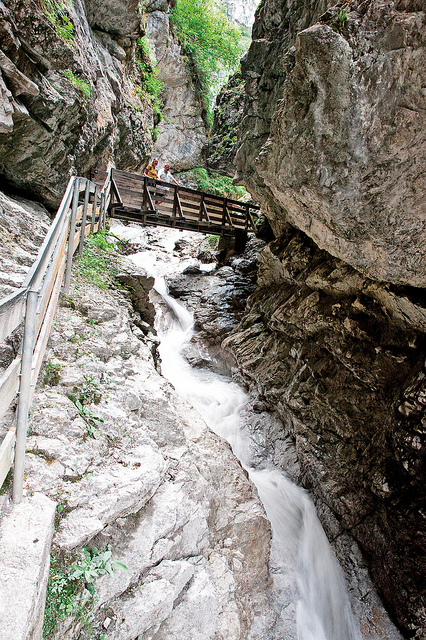 After Martina, the Inn River thunders through a gorge before it escapes into the Tyrol region of Austria at the eerie Finstermünz fortress bridge. You will pass through Pfunds and Tösens to Ried. Through the Obere Gericht (Upper Court) from Ried , you will cycle through the little summer resort of Prutz with its old forts and parish church (remodeled in Gothic style around 1520 and then in the Baroque style in the 17th c.) On to Landeck a former fortress town that occupies a hillside above the Inn River. 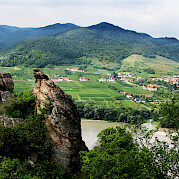 It huddles below the ruins of the 12 th c Schrofenstein castle, located on a ledge from where one enjoys a fantastic view. 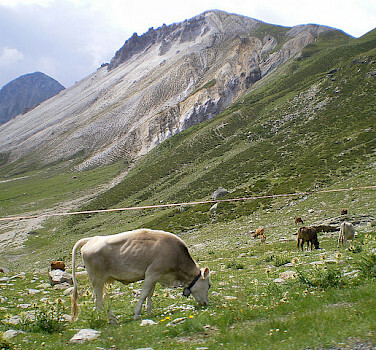 You will pass the monastery of Zams and travel through Milser Au to Imst (town of the wells). 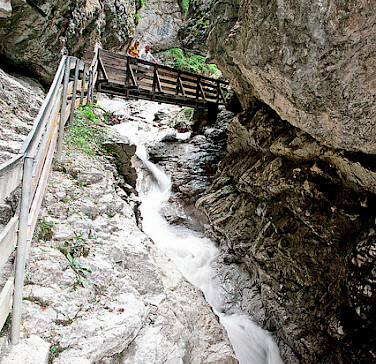 Time permitting a visit to Rosengartenschlucht (rose garden gorge) is recommended. Overnight in Imst. 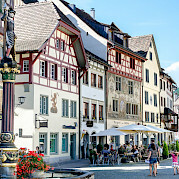 Finally your bicycle tour in Austria take you through the villages of Stams, Telfs and Inzing where will make your journey to the Olympic city of Innsbruck a feast for your eyes. Cultural highlight of today's stage include the Zisterzienserstrift Stams (collegiate church with rose grids) and other numerous small churches and ruins you will encounter. The city of Innsbruck with its Golden Roof, a late gothic bay window built in 1500 is a must visit on this last day of this cycling path. 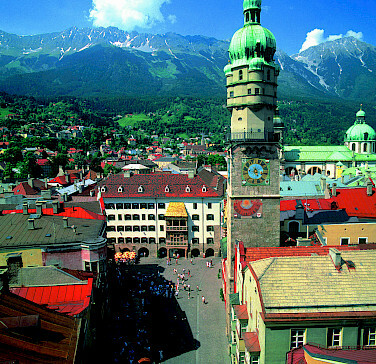 Situated between two impressive mountain chains, Innsbruck was host of the Olympic Winter Games in 1964 and 1976 and to this day remains a major winter sports center. Perhaps you will want to ride the gondola up Seegrube (2000 m) to enjoy the spectacular views of the Inn Valley and surrounding mountains. 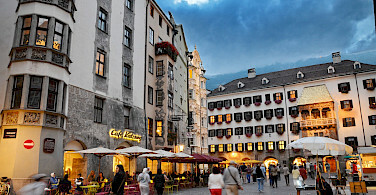 Innsbruck's beauty and medieval wonders have kept it one of Austria's most marveled at cities for centuries. 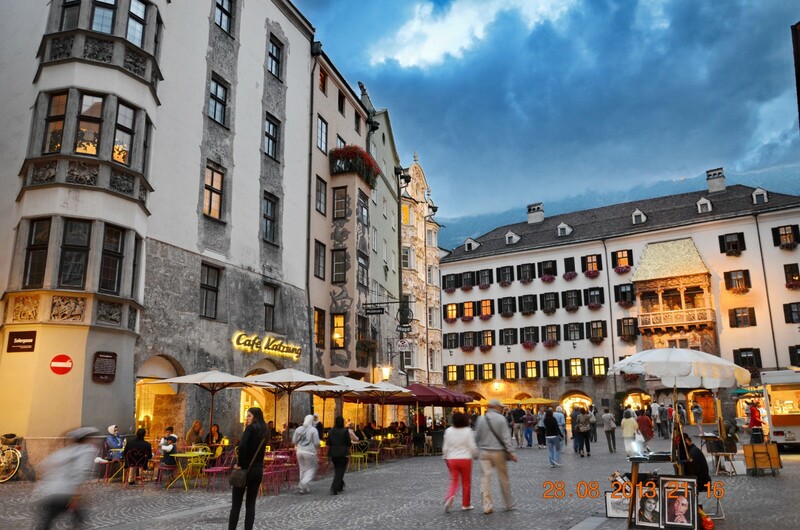 Along the cobblestone streets in the Altstadt (Old Town), you will come across magnificent Gothic architecture as well as Innsbruck’s most famous landmark, the Goldenes Dachl (Golden Roof). Built in 1500, this roof was built for Maximilian I, the Holy Roman Emperor, and is covered with 3000 gold-plated copper tiles. 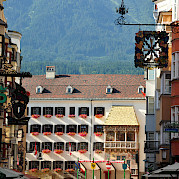 The balcony once served as Maximilian’s "ringside seat" during festive events in the square below. Furthermore, the Hofburg Palace served as his residence during the 15th century (with the paintings of the Hapsburg family still visible inside today). Also of note is that Innsbruck is the home of Swarovski Crystal, and has a theme park dedicated to the beautiful crystal art. 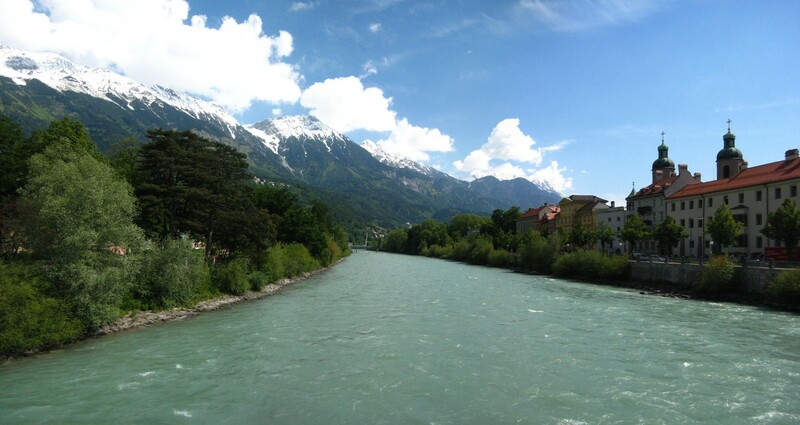 We decided to have our honeymoon on the St. Morritz to Innsbruck self-guided bike tour. We are so happy we did as the scenery was beautiful and the people we met along the way made it memorable. I recommend staying an extra night in St. Morritz so you can take the gondola up the mountain (free from the hotel when you stay 2 nights) to hike and enjoy the views. The bikes were sturdy and had the gears necessary for the hills. Bring your own helmet for this tour as they are not available to rent. 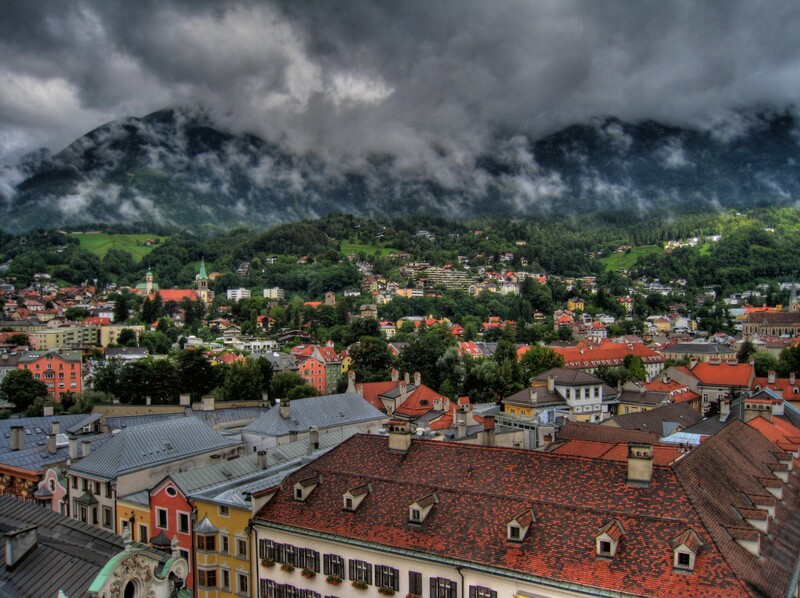 Most Memorable Part: The small towns set in the beautiful mountains with it clean air and pleasant residents. Wow....this is my fourth trip with Tripsite, this was the BEST natural scenery yet. The views of the mountains and countryside was breathe taking on every day. The hotels were very clean and well maintained; most hotels exceeded my expectations including the free breakfasts. Day #2 was the toughest day especially because the ascent was mostly on an unpaved surface, but the views on day #2 were the best. 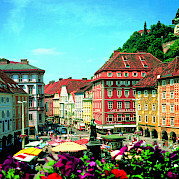 Switzerland and Austria are impeccably maintained countries; everyone was friendly and welcoming. With the main map in German, I appreciated the additional pamphlets in English in our packet. Most Memorable Part: The 3rd day of riding downhill. Tip: The first two days are difficult. When you train for this trip be sure to train on hills. We are long time customers to Tripsite and have always enjoyed our trips. 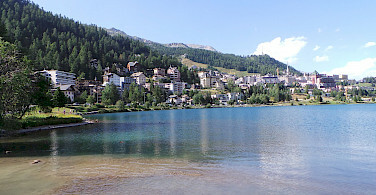 This year we did St Moritz to Innsbrook. It was an amazing trip with some of the best views we have ever seen. The ride was challenging for the first few days but then it got to be a typical river ride. We did a triple room package rather than paying for a single supplement and it worked great. All of the hotels were newly renovated and very modern. The people of Switzerland and Austria were very friendly and supportive. Again these trips in the alps are so spectacular! Looking forward to planning next years trip. This was our first European experience, and we enjoyed every minute of it! What a great way to get to know the countries we went to and engage with the locals. 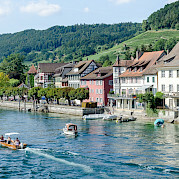 Our bike trip took us off the beaten path and in to the old tiny villages and backcountry of Switzerland and Austria. It was a trip we will never forget. 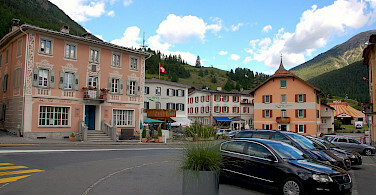 From the first day we arrived at our hotel in St. Moritz, Switzerland, with the exception of a flat tire, everything went off without a hitch. Thank you Tripsite!